Yesterday one of our most lovely product representatives said the term “end user” to describe our clients. I’ve never loved the phrase ; it feels cold and aloof to me and doesn’t quite describe the client in all cases. For instance, in a hospital, the Board of Trustees making the plays are not the nurses and patients who will walk the corridors day in and day out. Such is also the case in any urban planning project, where members of a council may never use the bus shelter or public playground they help shape. True end users are the people who will be affected by our design choices, including one member of the public who recently found great reason to bash a new light rail station entrance in Pittsburgh’s downtown. And he’s right, in some respects. The project is far from pretty (and pastel, as the author would like it to be). 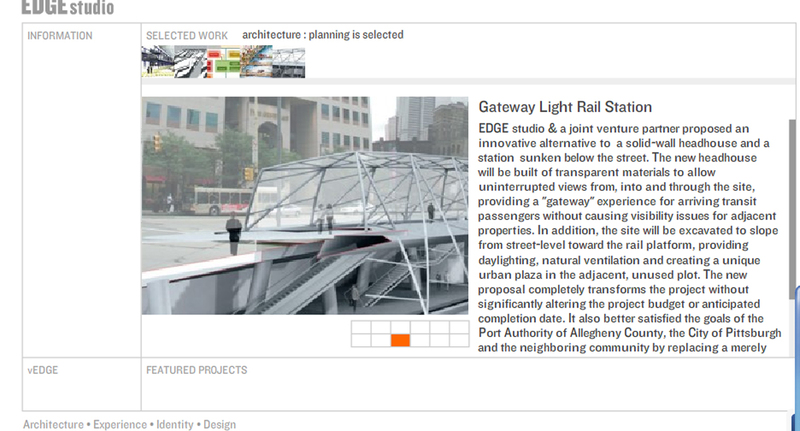 In fact, the gray, spindly images from the architecture firm’s website (EDGE studio) are akin to 1st year architecture studio path projects (of which it is hard to find evidence of, for none of us former students use it in portfolios and the project is not part of the curriculum any longer ). Perhaps it’s the half-toned silhouette people, too, that make it less appealing? Or, perhaps it’s the architecture (below). 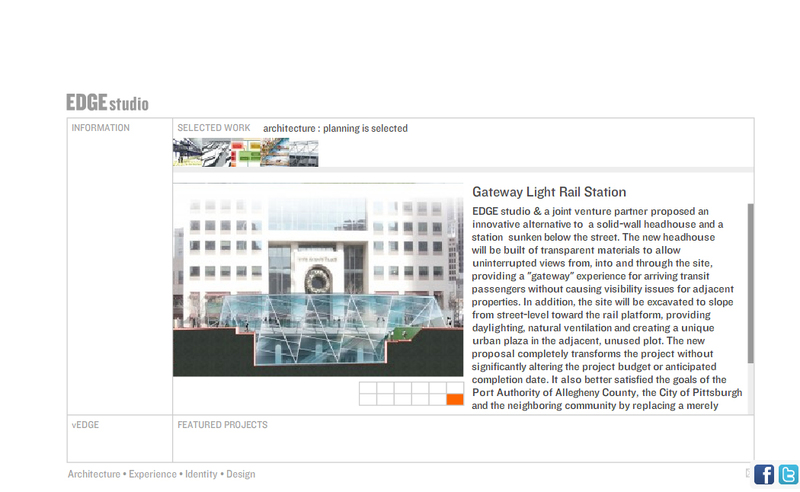 An excerpt from the letter reads,: This station should never have been built as is, and its existence bespeaks much that is wrong with Downtown planning. It looks much like a mutated millipede. It is plainly ugly. Second, it is made of steel pipes and glass. Now I ask: Is this city not already sufficiently gray from five months of near-continuous clouds? Are the older buildings not already sufficiently gray from years of industrial soot and grime? Is it wise, then, to build a Downtown of more gray/silver buildings (Gateway Center, Heinz Field and now the Gateway station at Stanwix) to further accentuate these drab and hard, cold, metallic surfaces that already define Pittsburgh? 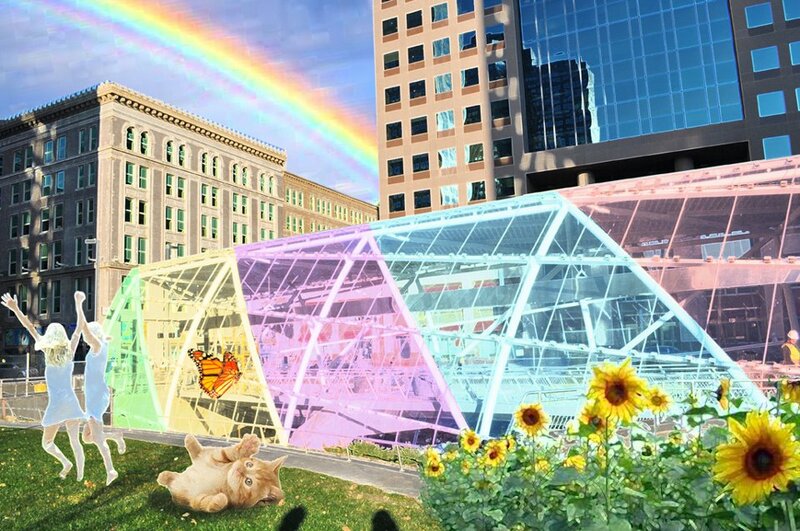 It is time for Pittsburgh to move beyond its industrial, gritty, grungy and grimy past. If only architecture could always stir up these emotions, right? The author has key points: the sky is perpetually gray, many buildings are likewise gray and while the gritty is sometimes romanticized, it really is time to spruce up Downtown. Twisted, muted enclosures are apparently not mean for sprucing. AND on the firm’s website, one of the renders does in fact depict the glazing in a pastel blue (below). ABOVE: Perhaps the architects should have taken their own images more literally? In jest, the architecture firm posted a photograph today (top of page) alluding to the demands of this Letter to the Editor in the Pittsburgh Post Gazette. Amazingly, this Photoshopped render hits on so many good interventions that looking at renders of the actual design leave me wishing this newly posted render wasn’t a joke! Green grass next to the station to sit upon while waiting for a train or a friend? Love. Actually, the only thing I have a problem with in this faux-render is the cat, because, well, I strongly dislike cats. I say kudos to this letter writer whose response to architecture stirred enough nerves in a group of designers to spur an image of what could never be, but, which could be, and happily. It’s “conversations” like this that make me happy to be part of firm so engaged with its public and so involved in organizing charrettes and public meetings. I have been doing my own thinking about end users lately, and wondering why nobody ever does post-occupancy evaluations. What this reminds me of, though, is some of the disconnect between the ways architects communicate with each other and with their, to use the phrase for consistency, end users. A lot of their imagery on their (very slick) website communicates pretty well to me as an architect because I’m able to put myself in that space and get how it feels. Most people, though, haven’t developed that ability for their entire lives and have to go on how it looks, how it’s presented to them. And in that way I can absolutely see how someone might have been expecting something much more bright and inviting in terms of color might be disappointed in how it looks in the end. But compare it to most subway stations, and I think by and large it can be considered a success. The openness, the natural light, the unconventional forms, all are improvements over a typical subway experience. Unfortunately, the subway goes to the casino instead of anywhere useful, but that’s a whole other story. We spent four years learning how to perceive and create visuals that a fellow designer can respond to, and then fifth year when we did the Urban Lab studio, a whole new vocabulary of large arrows and dashed lines were taught to us but not until we went to our first public meeting did I realize that these abstract renders and line drawings with unrealistic vantage points (no one ever truly views anything sectionaly or in plan) spoke to no one but the twelve of us presenting! I thought the worst was at a community planning session a few weeks ago when the presenter threw up a slide with four rectangles and said “imagine these are you new schools”, but only conceptually. HUH? From that slide forward, no one could think of the schools outside of those boxes. It was an awful breakdown in communication because the presenter could have used ducks or apples or octagons to make his point of four distinct, related locations, but the rectangle was the symbol he chose and so the abstraction became literal all too easily for the room of lay people.